"...Burly body-building enthusiast Khalid Masood, 52, was born in Dartford in Kent on Christmas Day 1964. His mother Janet Ajao gave birth when she was just 17 years old and brought him up as Adrian Russell Ajao. The married father-of-three spent years moving round the country - and the prison system - with a host of different identities, including Adrian Elms.He was most recently based in the West Midlands and had a history of violent knife crime, converting to Islam after years of criminality..."
52-year old Khalid Masood, a British-born Muslim, responsible for murder of three in London attack. 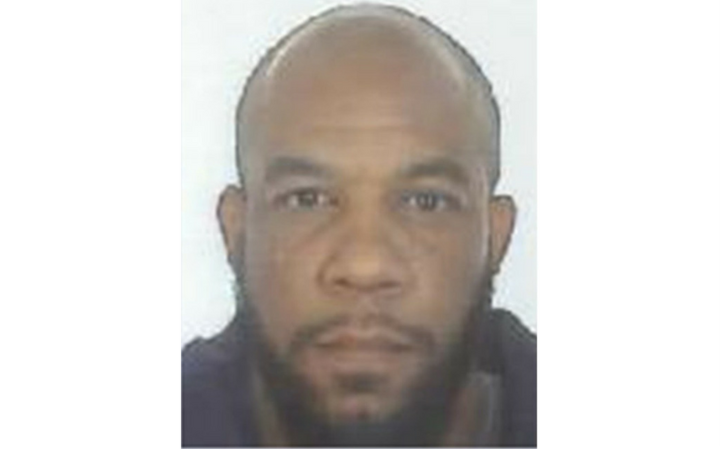 The terrorist responsible for Wednesday's deadly attack outside of the British parliament in London was identified by British authorities on Thursday as 52-year old Khalid Masood. Police say Masood, a resident of the West Midlands, was born in Kent, England. Authorities noted that Masood had not terror convictions and was not the subject of a terror investigation at the time of the attack. "Prior to #WestminsterAttack Masood,52, was not subject of any current investigations & no intel about his intent to mount a terrorist attack," the London Metropolitan Police wrote in a twitter comment Thursday. But according to Scotland Yard, Masood did have a lengthy record of other offenses, not related to terrorism – including violent crimes. From 1983 to 2003, Masood was convicted in a number of cases, including property damage, assault, weapons possession, and disrupting the peace. On Wednesday, Masood crashed into a crowd of pedestrians walking on Westminster Bridge near Parliament with a rented SUV. Two people were killed and dozens injured. Masood then exited his vehicle and stabbed Keith Palmer, a London police officer, to death before being shot and killed at the scene. On Thursday, police in Belgium said a 39-year old French man of North African descent identified as Mohamed R. was arrested after he attempted to ram pedestrians in a crowded outdoor shopping center in Antwerp. A shotgun, knives, and unidentified liquid were later found in his car. Earlier on Thursday the ISIS terror group claimed responsibility for the attack in London, proclaiming Masood a "soldier of ISIS". Ramming and stabbing attack near British Parliament building leaves 4 dead, including terrorist attacker. At least three people, including a police officer, were killed and twenty people were reported injured in a vehicular ramming attack near the British Parliament in London Wednesday afternoon, according to media reports. According to witnesses, a car mowed down a dozen pedestrians on the Westminster Bridge before crashing into the gates outside of the Portcullis House, The Sun reported. Two men have reportedly been shot by police after attempting to to stab officers outside of the Houses of Parliament. "We heard a loud bang, lots of shouting and saw men running around. Someone rushed through, attacked a policeman," a witness told The Sun. "He appeared to be carrying a knife or a gun. We then heard gunfire, five or six rounds." In addition to the three victims. the terrorist was also killed. "We were called at approx 2:40 pm to reports of an incident at Westminster Bridge. Being treated as a firearms incident - police on scene," the Metropolitan police announced on Twitter. Parliament sessions have been suspended following the incident. Commons Leader David Lidington told MPs: "What I am able to say to the House is there has been a serious incident within the estate. It seems that a police officer has been stabbed, that the alleged assailant was shot by armed police." "An air ambulance is currently attending the scene to remove the casualties. The London police announced that they are treating the incident as a terrorist attack. Israeli Deputy Foreign Minister Tzipi Hotovely condemned the attack. "Israel expresses its deep shock at the terror attack in London today and its solidarity with the victims and with the people and government of Great Britain. Terror is terror wherever it occurs and we will fight it relentlessly." Israeli Ambassador to the UN, Danny Danon, said: "Israel stands as one with the British people as we all work together to defeat the scourge of terrorism. We send our condolences and wish a speedy recovery to all those injured." Acting Deputy Commissioner Mark Rowley, this morning, Friday, 24 March, appealed for the public's help. He said: "We named the dead terrorist as Khalid Masood, and as I said, our investigation focuses on understanding his motivation, preparation and his associates. "At this point I want to appeal specifically to the public. "There might well be people out there who did have concerns about Masood but weren't sure or didn't feel comfortable for whatever reason in passing information to us. "I urge anyone with such information to contact us the Anti-Terrorist hotline which is 0800 789 321."